The Tipsy Elves Bride fanny pack comes complete with a detachable tutu and Drink Holder. Pairs perfectly with the Black Squad fanny packs and any of the Tipsy Elves Tanks and Shirts! The perfect hip bag for brides to wear during their bachelorette party or wedding weekend. 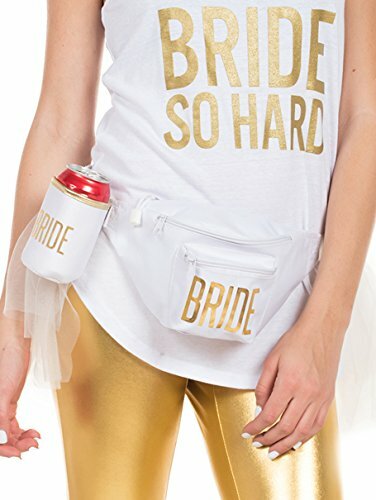 The Bride fanny pack features a removable white lace tutu as well as a detachable koozie that also says "BRIDE" in gold. Both fanny packs have three (3) functional compartments with white zippers and drink holder. Waist pack has an adjustable strap that fits waists ranging in size from The adjustable strap fits waist sizes ranging from 28-inches to 38-inches around. Bachelorette Party fanny pack ships within one business day via Amazon's PRIME service. If you have any questions about this product by Tipsy Eleves, contact us by completing and submitting the form below. If you are looking for a specif part number, please include it with your message.